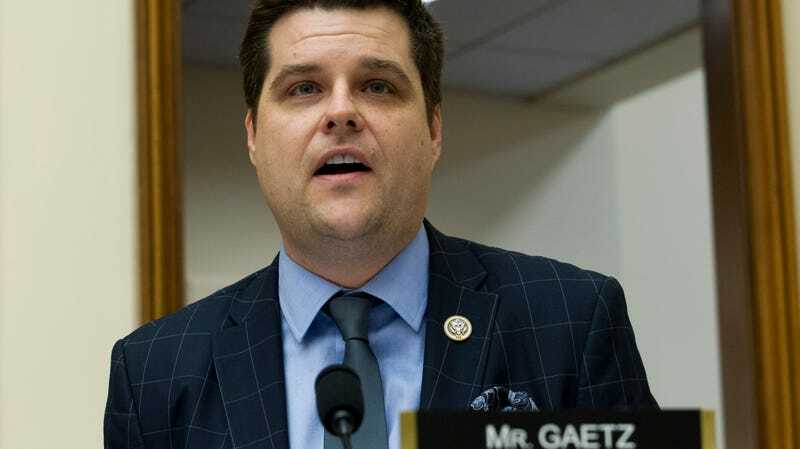 Green Real Deal author Representative Matt Gaetz. To date, Republicans’ best defense against the Green New Deal has been to yell about socialism, ice cream, and hamburgers. But it appears at least one Republican member of Congress might go on the offense and offer an alternative. I am sorry to report the Green Real Deal is not, in fact, the real deal. The five-page draft resolution—which could change when or even if it gets introduced in the House—is light on policy specifics, timelines, and goals. But even so, it speaks to how far the Overton window has moved on climate policy in just a few short months, largely due to Alexandria Ocasio-Cortez’s Green New Deal. A Republican is introducing legislation to address climate change without bipartisan cover (though Gaetz could still find Democratic co-sponsors) was almost unthinkable even late last year. Comparing the Green New Deal and Green Real Deal also show how differently Republicans view climate change. For one, Gaetz’s proposal is nowhere near as robust as the Green New Deal. It sets no target date for decarbonization or warming levels. Nor does it mention transportation—the largest carbon-emitting sector—or how it will deal with fossil fuel workers caught up in the transition to renewables to name just a few shortcomings. It also doesn’t mention a carbon tax, which is in vogue with Republican economists and was included in the recent attempts at Republican-led climate legislation. Instead, it offers up a few ideas like voluntary carbon emission reporting, investing in carbon capture, deregulation, and “fair and equal access to energy development on federal lands,” which with the carbon capture part, sounds an awful lot like continuing fossil fuel development. To put it mildly, these ideas are wholly inadequate to address the scope of carbon pollution. That makes it unserious as a standalone climate policy document. But in the broader context, it has value as a yardstick. First, there’s the reality that any Republican putting forward an alternative to the Green New Deal, let alone riffing on the language is a big step. A few months ago, not even Democrats were talking about introducing overarching climate legislation. Then there’s the framing of Gaetz’s resolution as a response to the Green New Deal, which showcases the gulf between how the left and right view climate change. The Green New Deal focusing on the crises of climate change and inequality and argues we need to reform our current economic system to address those challenges. Gaetz’s Green Real Deal proposal presents a more cheery picture by leading with how much progress the U.S. has made cutting carbon emissions, and focuses on tiny nudges to the current system. This illustrates what could await Democrats in 2020 if they win the presidency and the Senate. Nuking the filibuster could conceivably allow them to pass the Green New Deal or other ambitious climate legislation on the table. But keeping it in place would mean compromising, and some of Gaetz’s ideas could very well be part of that discussion.